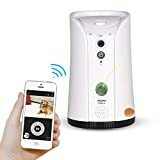 This cool new Furbo is a peace-of-mind bit of technology for your home that allows you to watch, talk to, and toss treats to your furry best friend right from your smartphone anywhere you might be. 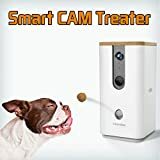 Just fill it with treats, connect it to Wi-Fi, download the free app, and enjoy watching your dog when you're away from home in realtime using its built-in full HD camera that has night vision, a 160 degree wide angle lens, and 4X zoom. 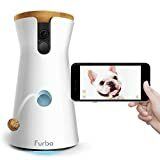 With a press of a button on the app, the Furbo can launch a treat up into the air or you can even have a 2-way audio "conversation" with your pet. It can even detect barking and other specific dog activities and send you alerts as well. 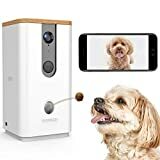 Perfect for checking in on your dog (and your home) and a great way to alleviate separation anxiety, yours and theirs. Dog Selfie Alert: Know when your dog misses you. Furbo detects when your dog is facing the camera, taking the most precious selfies. Alexa: Toss a treat or schedule treat tossing as you head out the door, hands-free!